Hochelaga, an old native word for the present site of Montréal, was originally the residence of managers of the Bank of Montreal. As F.M. 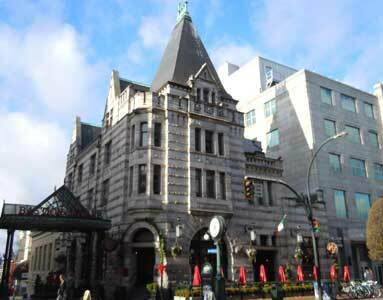 Rattenbury designed the Bank of Montreal at 1200 Government St, Downtown, his name was long associated with the house. 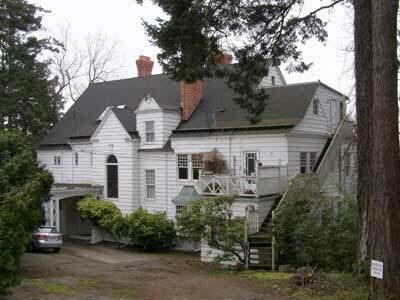 However, Rattenbury merely lived here briefly while his own residence on Beach Drive in Oak Bay was being built. As there are similar details in Rattenbury’s residence, now Glenlyon School, he probably borrowed them from Evers and Keith. This two-storey, side-gabled, Shingle-style house, now encased in aluminum siding, was an unusual house for Victoria, with its cladding of continuous wood shingles with no break at the corners. On the rear or garden façade there is a wide, pedimented cross-gable; it has a sleeping porch and is jettied on modillions. Below to the left is a wide, two-storey angled bay, and to the right is a one-storey, half-round bay under a balustraded balcony. On the left rear a full-height angled bay below a balcony wraps around the corner. The roofline is flush with the wall at gable ends and overlaps only slightly at the soffits; it has short returns around the corners under the gables and built-in Yankee gutters above the roof edge. The staggered roofline of the front façade exhibits an unusual, broken Queen Anne pedimented gabled dormer to the right of a shallow, gabled, full-height box bay with returns on the gable. A long, round-arched leaded window is centred in the bay. To the left of that the remains of the porte-cochère form an entry porch. There is a newer oriel bay on the main floor to the right of the bay. Three ribbed and corbelled brick chimneys, which were painted white for many years, are now restored. In 1913 A.A. Cox designed a two-storey, three bedroom addition which cost $3,000. At the same time, Cox designed a $20,000 one-storey rear addition for the Bank of Montreal at 1200 Government St, also built by Westholme Lumber Co. An inset entrance on the front left corner with large curved openings was later enclosed. The various bays and balconies have undergone alterations. “Xs” replaced the original simple square balusters prior to 1969. 1892-1912: Archibald J.C. Galletly (c.1848-1914) was the first manager of the Bank of Montreal’s Victoria branch in 1891, in the old Bank of British North America Building on Government St. Archibald was born on the Greek Island of Corfu to Margaret and Col. Frederick Galletly, commander of a regiment on the island. The family moved to Montreal c.1878, and Archibald joined the Bank of Montreal. He worked in Brockville, Brantford, Port Hope, Halifax, and Victoria, where he was manager 1891- 1912, and then retired. His first wife, Jeannie Geraldine (née Surrie, c.1850-1904), and daughter Jessie McDuff (1883-1904) died on the SS Clallam when it sank off Trial Island in 1904. In 1905 Archibald married Margaret May Cox in London, ENG. In 1914 he collapsed and died at the Clover Point Rifle Range, apparently of a seizure. Margaret Galletly remained in Victoria for about 16 years, then moved to Europe. She died in Rome in 1935. Three other Bank of Montreal managers lived here.Three other Bank of Montreal managers lived here. 1912-14: James Sutherland Chisholm Fraser (c.1863- 1914) became manager in 1912, after managing the Rossland branch for 12 years. He married widow Laura Martin Clinton (née English, 1873-1958, 528 St. Charles St, Rockland) in 1903. He died of ptomaine poisoning while in Toronto. 1914-24: Alexander Montizambert (b. Québec 1854-1930) and Emilie (née Archibald, b. Belleville, ON 1864-1940) was transferred from Ontario to replace Fraser. Alexander joined the Bank of Montreal in 1872, worked in Nova Scotia and Ontario, then was transferred to replace Fraser. He retired in 1924. 1925-34: Ernest Willet McMullen (b. Belleville, ON 1873- 1957) worked with the Merchants’ Bank of Canada in Manitoba, Alberta and Victoria. When this bank merged with the Bank of Montreal he became manager of the main branch here. Ernie was involved in many local organizations, including the Chamber of Commerce, Navy League, Union Club, Pacific Club and the Masonic Lodge. The house was vacant several years, then non-Bank of Montreal people moved in. 1938-39: Cdr. Rupert Wainman- Wood, RCN, and his wife Marjory. 1941-63+: Warren Hilton (b. St. Louis, MO 1874-1958) and Adele Petranella (née Nelson, b. Chicago 1893-1982). Warren graduated from Harvard and Washington universities, was financial advisor to a number of large US corporations, and secretary of Western Steel Corporation. He lectured in psychology, founded the Society of Applied Psychology and wrote 12 books. Warren and Adele travelled the world, then lived in the Hollywood Hills before coming here in the mid-1930s. Adele lived here for some time after Warren’s death.